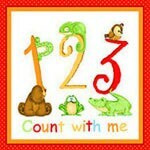 ABC-123 Numbers Book Panel by Shelly Comiskey for Henry Glass. 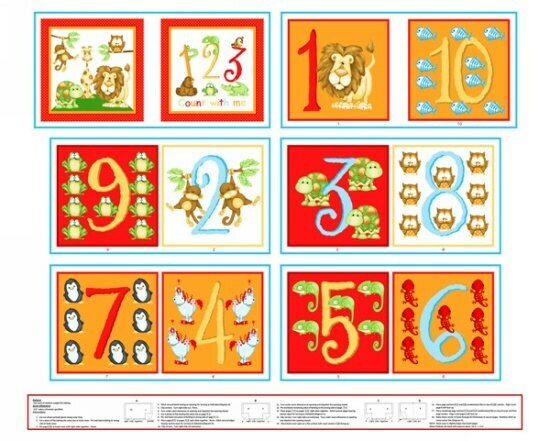 Bright and colorful book panel with numbers and animals. This 35 x 44 inch panel is right side up when the selvages are on the sides. It has 12 pages, the outer ones are 9 inches square and is 100 percent first quality cotton. Use this panel as it was designed for a cloth book or cut the blocks apart and create a fun children's quilt. Add batting and 1 yard of backing fabric and you have a fun quilt to create in less than just a few hours. All fabric from The Quilted Nursery Children's Fabric Store is cut directly from the bolt. Same day shipping always. Don't forget about our coupon codes! Item as described - I'll be back to order more book panels Thanks!!! Love this item, I already have both put together and absolutely love them. Item came fast and no problems at all with anything. Just amazing experience and product.